b. Defined as a restoration by the Constitution. c. Centavo coins also used. d. .tp is being phased out. East Timor () or Timor-Leste (), officially the Democratic Republic of Timor-Leste, is a country in Maritime Southeast Asia. It comprises the eastern half of the island of Timor, the nearby islands of Atauro and Jaco, and Oecusse, an exclave on the northwestern side of the island, within Indonesian West Timor. The country's size is about 15,410 km2 (5,400 sq mi). East Timor was colonised by Portugal in the 16th century, and was known as Portuguese Timor until Portugal's decolonisation of the country. In late 1975, East Timor declared its independence but later that year was invaded and occupied by Indonesia and was declared Indonesia's 27th province the following year. In 1999, following the United Nations-sponsored act of self-determination, Indonesia relinquished control of the territory, and East Timor became the first new sovereign state of the 21st century on May 20, 2002. After independence, East Timor became a member of the United Nations and the Community of Portuguese Language Countries. In 2011, East Timor announced its intention to gain membership status in the Association of Southeast Asian Nations by submitting a letter of application to become its eleventh member. It is one of only two predominantly Christian nations in Southeast Asia, the other being the Philippines. East Timor has a lower-middle-income economy. About 37.4% of the country's population lives below the international poverty line – which means living on less than U.S. $1.25 per day – and about 50% of the population is illiterate. It continues to suffer the after-effects of a decades-long struggle for independence against Indonesian occupation, which severely damaged the country's infrastructure and killed at least a hundred thousand people. The country is placed 128th on the Human Development Index (HDI). The official names under the Constitution are República Democrática de Timor-Leste in Portuguese and Repúblika Demokrátika Timor-Leste in Tetum. Descendants of at least three waves of migration are believed to still live in East Timor. The first were related to the principal Australoid indigenous groups of New Guinea and Australia, and arrived more than 40,000 years ago. Around 3000 BC, Austronesians migrated to Timor, and are thought to be associated with the development of agriculture on the island. Thirdly, proto-Malays arrived from south China and north Indochina. Before European colonialism, Timor was included in Chinese and Indian trading networks, and in the 14th century was an exporter of aromatic sandalwood, slaves, honey, and wax. It was the relative abundance of sandalwood in Timor that attracted European explorers to the island in the early 16th century. During that time, European explorers reported that the island had a number of small chiefdoms or princedoms. At the beginning of the twentieth century, a faltering home economy prompted the Portuguese to extract greater wealth from its colonies, which was met with East Timorese resistance. During World War II, the Japanese occupied Dili, and the mountainous interior became the scene of a guerrilla campaign, known as the Battle of Timor. Waged by Allied forces and East Timorese volunteers against the Japanese, the struggle resulted in the deaths of between 40,000 and 70,000 East Timorese. Following the end of the war, Portuguese control was reinstated. The Revolutionary Front for an Independent East Timor (Fretilin) resisted a Timorese Democratic Union (UDT) coup attempt, and unilaterally declared independence on November 28, 1975. Fearing a communist state within the Indonesian archipelago, the Indonesian military, with western support, launched an invasion of East Timor in December 1975. Indonesia declared East Timor its 27th province on 17 July 1976 (Timor Timur). The UN Security Council opposed the invasion and the territory's nominal status in the UN remained as "non-self-governing territory under Portuguese administration". Indonesia's occupation of East Timor was marked by violence and brutality. A detailed statistical report prepared for the Commission for Reception, Truth and Reconciliation in East Timor cited a minimum bound of 102,800 conflict-related deaths in the period 1974–1999, namely, approximately 18,600 killings and 84,200 "excess" deaths from hunger and illness. The East Timorese guerrilla force, Falintil, fought a campaign against the Indonesian forces from 1975 to 1999. The invasion was supported by the United States. The 1991 Dili Massacre was a turning point for the independence cause internationally, and an East Timor solidarity movement grew in Portugal, Australia, and other western countries. Following the resignation of Indonesian President Suharto, a UN-sponsored agreement between Indonesia and Portugal allowed for a UN-supervised popular referendum in August 1999. A clear vote for independence was met with a punitive campaign of violence by East Timorese pro-integration militia with the support of elements of the Indonesian military. With Indonesian permission, an Australian-led international peacekeeping force was deployed until order was restored. In late 1999, the administration of East Timor was taken over by the UN through the United Nations Transitional Administration in East Timor (UNTAET). The INTERFET deployment ended in February 2000 with the transfer of military command to the UN. By May 2002, over 205,000 refugees had returned, and East Timorese independence was formalised on 20 May 2002 with Xanana Gusmão sworn in as the country's first President. East Timor became a member of the UN in 2002. The head of state of East Timor is the President of the Republic, who is elected by popular vote for a five-year term. Although his executive powers are somewhat limited, the president does have veto power over government's legislation. Following elections, the president appoints the leader of the majority party or majority coalition as the Prime Minister of East Timor. As head of government, the prime minister presides over the cabinet. 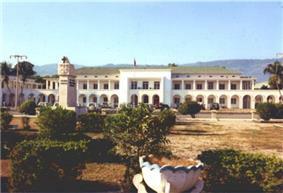 The unicameral East Timorese parliament is the National Parliament or Parlamento Nacional, whose members are elected by popular vote to a five-year term. The number of seats can vary from a minimum of fifty-two to a maximum of sixty-five. The East Timorese constitution was modeled on that of Portugal. The country is still in the process of building its administration and governmental institutions. Government departments include the Polícia Nacional de Timor-Leste (police), East Timor Ministry for State and Internal Administration, Civil Aviation Division of Timor-Leste, and Immigration Department of Timor-Leste. East Timor is divided into thirteen administrative districts, which, in turn, are subdivided into 65 subdistricts, 442 sucos (villages), and 2,225 aldeias (hamlets). East Timor sought membership in the Association of Southeast Asian Nations (ASEAN) in 2007, and a formal application was submitted in March 2011. Indonesia supports East Timor's bid to join ASEAN. The Timor Leste Defence Force (F-FDTL) is the military body responsible for the defence of East Timor. The F-FDTL was established in February 2001 and comprised two small infantry battalions, a small naval component, and several supporting units. The F-FDTL's primary role is to protect East Timor from external threats. It also has an internal security role, which overlaps with that of the National Police of East Timor (Policia Nacional de Timor Leste, PNTL). This overlap has led to tensions between the services, which have been exacerbated by poor morale and lack of discipline within the F-FDTL. Located in Southeast Asia, the island of Timor is part of the Maritime Southeast Asia, and is the largest and easternmost of the Lesser Sunda Islands. To the north of the island are the Ombai Strait, Wetar Strait, and the greater Banda Sea. The Timor Sea separates the island from Australia to the south, and the Indonesian Province of East Nusa Tenggara lies to East Timor's west. Much of the country is mountainous, and its highest is Tatamailau (also known as Mount Ramelau) at 2,963 metres (9,721 ft). The climate is tropical and generally hot and humid. It is characterised by distinct rainy and dry seasons. 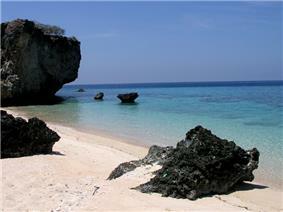 The capital, largest city, and main port is Dili, and the second-largest city is the eastern town of Baucau. East Timor lies between latitudes 8° and 10°S, and longitudes 124° and 128°E. 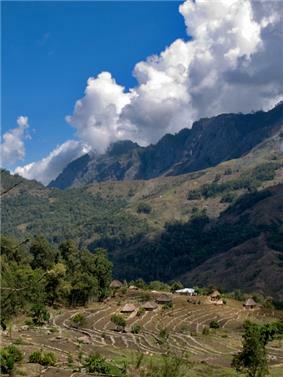 The easternmost area of East Timor consists of the Paitchau Range and the Lake Ira Lalaro area, which contains the county's first conservation area, the Nino Konis Santana National Park. It contains the last remaining tropical dry forested area within the country. It hosts a number of unique plant and animal species and is sparsely populated. The northern coast is characterised by a number of coral reef systems that have been determined to be at risk. East Timor has a market economy that used to depend upon exports of a few commodities such as coffee, marble, oil, and sandalwood. 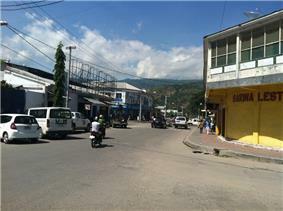 East Timor's economy grew by about 10% in 2011 and at a similar rate in 2012. Timor now has revenue from offshore oil and gas reserves, but little of it has gone to develop villages, which still rely on subsistence farming. Nearly half the population lives in extreme poverty. The Timor-Leste Petroleum Fund was established in 2005, and by 2011 it had reached a worth of US$8.7 billion. East Timor is labelled by the International Monetary Fund as the "most oil-dependent economy in the world". The Petroleum Fund pays for nearly all of the government's annual budget, which has increased from $70 million in 2004 to $1.3 billion in 2011, with a $1.8 billion proposal for 2012. The economy is dependent on government spending and, to a lesser extent, assistance from international donors. Private sector development has lagged due to human capital shortages, infrastructure weakness, an incomplete legal system, and an inefficient regulatory environment. 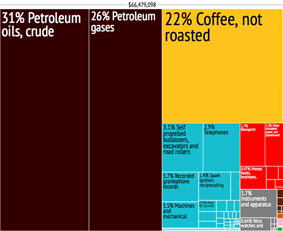 After petroleum, the second largest export is coffee, which generates about $10 million a year. Starbucks is a major purchaser of East Timorese coffee. According to data gathered in the 2010 census, 87.7% of urban and 18.9% of rural households have electricity, for an overall average of 36.7%. The agriculture sector employs 80% of the active population. In 2009, about 67,000 households grew coffee in East Timor, with a large proportion being poor. Currently, the gross margins are about $120 per hectare, with returns per labor-day of about $3.70. There are 11,000 household growing mungbeans as of 2009, most of them subsistence farmers. The country was ranked 169th overall and last in the East Asia and Pacific region by the Doing Business 2013 report by the World Bank. The country fared particularly poorly in the 'registering property', 'enforcing contracts' and 'resolving insolvency' categories, ranking last worldwide in all three. In regards to telecommunications infrastructure, Timor-Leste is the 2nd to last ranked Asian country in the World Economic Forum's Network Readiness Index (NRI) with only Myanmar falling behind it in southeast Asia. NRI is an indicator for determining the development level of a country’s information and communication technologies. Timor-Leste ranked number 141 overall in the 2014 NRI ranking, down from 134 in 2013. The Portuguese colonial administration granted concessions to Oceanic Exploration Corporation to develop petroleum and natural gas deposits in the waters southeast of Timor. However, this was curtailed by the Indonesian invasion in 1976. The resources were divided between Indonesia and Australia with the Timor Gap Treaty in 1989. East Timor inherited no permanent maritime boundaries when it attained independence. A provisional agreement (the Timor Sea Treaty, signed when East Timor became independent on 20 May 2002) defined a Joint Petroleum Development Area (JPDA) and awarded 90% of revenues from existing projects in that area to East Timor and 10% to Australia. An agreement in 2005 between the governments of East Timor and Australia mandated that both countries put aside their dispute over maritime boundaries and that East Timor would receive 50% of the revenues from the resource exploitation in the area (estimated at A$26 billion, or about US$20 billion over the lifetime of the project) from the Greater Sunrise development. In 2013, East Timor launched a case at the Permanent Court of Arbitration in The Hague to pull out of a gas treaty that it had signed with Australia, accusing the Australian Secret Intelligence Service (ASIS) of bugging the East Timorese cabinet room in Dili in 2004. The population of East Timor is about 1,143,667. 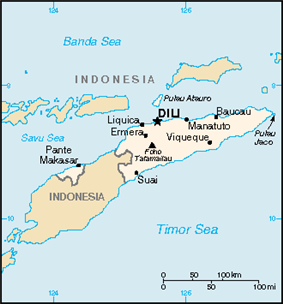 The population is especially concentrated in the area around Dili. The word Maubere, formerly used by the Portuguese to refer to native East Timorese and often employed as synonymous with the illiterate and uneducated, was adopted by FReTiLIn as a term of pride. They consist of a number of distinct ethnic groups, most of whom are of mixed Malayo-Polynesian and Melanesian/Papuan descent. The largest Malayo-Polynesian ethnic groups are the Tetum (100,000), primarily in the north coast and around Dili; the Mambai (80,000), in the central mountains; the Tukudede (63,170), in the area around Maubara and Liquiçá; the Galoli (50,000), between the tribes of Mambae and Makasae; the Kemak (50,000) in north-central Timor island; and the Baikeno (20,000), in the area around Pante Macassar. The main tribes of predominantly Papuan origin include the Bunak (50,000), in the central interior of Timor island; the Fataluku (30,000), at the eastern tip of the island near Lospalos; and the Makasae, toward the eastern end of the island. As a result of interracial marriage which was common during the Portuguese era, there is a population of people of mixed East Timorese and Portuguese origin, known in Portuguese as mestiços. There is a small Chinese minority, most of whom are Hakka. Many Chinese left in the mid-1970s. East Timor's two official languages are Portuguese and Tetum. Tetum belongs to the Austronesian family of languages spoken throughout Southeast Asia. Indonesian and English are defined as working languages under the Constitution in the Final and Transitional Provisions, without setting a final date. 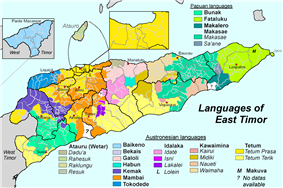 Aside from Tetum, Ethnologue lists the following indigenous languages: Adabe, Baikeno, Bunak, Fataluku, Galoli, Habun, Idaté, Kairui-Midiki, Kemak, Lakalei, Makasae, Makuv'a, Mambae, Nauete, Tukudede, and Waima'a. It is estimated that English is understood by 31.4% of the population. 23.5% speak, read, and write Portuguese as of 2012, which is up significantly from less than 5% in the 2006 UN Development Report. 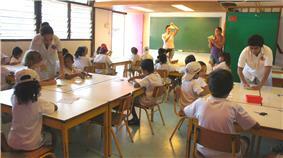 East Timor's adult literacy rate in 2010 was 58.3 per cent, up from just 37.6% in 2001. Illiteracy is higher among women. Illiteracy was at 95 per cent at the end of Portuguese rule. In 2006, 10% to 30% of primary-school age children did not attend school. Since independence, both Indonesian and Tetum have lost ground as mediums of instruction, while Portuguese has increased: in 2001 only 8.4% of primary school and 6.8% of secondary school students attended a Portuguese-medium school; by 2005 this had increased to 81.6% for primary and 46.3% for secondary schools. Indonesian formerly played a considerable role in education, being used by 73.7% of all secondary school students as a medium of instruction, but by 2005 it was used by most schools only in Baucau, Manatuto, as well as the capital district. Life expectancy at birth was at 60.7 in 2007. The fertility rate is at six births per woman. Healthy life expectancy at birth was at 55 years in 2007. Government expenditure on health was at US$150 (PPP) per person in 2006. Many people in East Timor lack safe drinking water. There were two hospitals and 14 village healthcare facilities in 1974. By 1994, there were 11 hospitals and 330 healthcare centres. The 2010 maternal mortality rate per 100,000 births for East Timor is 370. This is compared with 928.6 in 2008 and 1016.3 in 1990. The under-5 mortality rate per 1,000 births is 60 and the neonatal mortality rate per 1,000 live births is 27. The number of midwives per 1,000 live births is 8 and the lifetime risk of death for pregnant women is 1 in 44. According to the Global Hunger Index of 2013, East Timor has an GHI indicator value of 29.6 indicating that the nation has an 'Alarming Hunger Situation' earning the nation the distinction of being the hungriest country in the entire continent of Asia and the 4th hungriest nation in the world. In 2007, a bad harvest led to deaths in several parts of East Timor. By November, eleven subdistricts still needed food supplied by international aid. According to the 2010 census, 96.9% of the population profess Catholicism; 2.2% Protestantism or Evangelicalism; 0.3% are Muslim; and 0.5% practise some other or no religion. The number of churches has grown from 100 in 1974 to over 800 in 1994, with Church membership having grown considerably under Indonesian rule as Pancasila, Indonesia's state ideology, requires all citizens to believe in one God and does not recognise traditional beliefs. 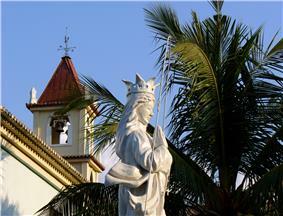 In rural areas, Catholicism is practised along with local traditions. While the Constitution of East Timor enshrines the principles of freedom of religion and separation of church and state in Section 45 Comma 1, it also acknowledges "the participation of the Catholic Church in the process of national liberation". Upon independence, the country joined the Philippines to become the only two predominantly Roman Catholic states in Asia, although nearby parts of eastern Indonesia such as West Timor and Flores also have Catholic majorities. The Roman Catholic Church divides East Timor into three dioceses: the Diocese of Díli, the Diocese of Baucau, and the Diocese of Maliana. 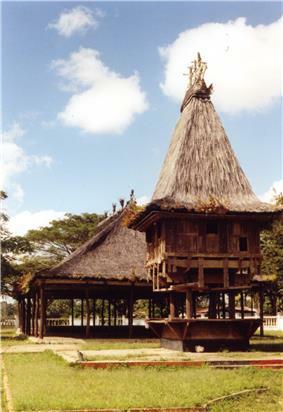 The culture of East Timor reflects numerous influences, including Portuguese, Roman Catholic and Indonesian, on Timor's indigenous Austronesian and Melanesian cultures. 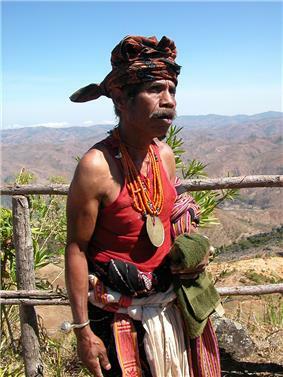 East Timorese culture is heavily influenced by Austronesian legends. For example, East Timorese creation myth has it that an aging crocodile transformed into the island of Timor as part of a debt repayment to a young boy who had helped the crocodile when it was sick. As a result, the island is shaped like a crocodile and the boy's descendants are the native East Timorese who inhabit it. The phrase "leaving the crocodile" refers to the pained exile of East Timorese from their island. There is also a strong tradition of poetry in the country. Prime Minister Xanana Gusmão, for example, is a distinguished poet. An extensive collection of Timorese audiovisual material is held at the National Film and Sound Archive of Australia. These holdings have been identified in a document titled The NFSA Timor-Leste Collection Profile, which features catalogue entries and essays for a total of 795 NFSA-held moving image, recorded sound and documentation works that have captured the history and culture of East Timor since the early 20th century. The NFSA is working with the East Timor government to ensure that all of this material can be used and accessed by the people of that country. In 2013 the first East Timorese feature film, Beatriz's War, was released. The cuisine of East Timor consists of regional popular foods such as pork, fish, basil, tamarind, legumes, corn, rice, root vegetables, and tropical fruit. East Timorese cuisine has influences from Southeast Asian foods and from Portuguese dishes from its colonisation by Portugal. Flavours and ingredients from other former Portuguese colonies can be found due to the centuries-old Portuguese presence on the island. Sports organisations joined by East Timor include the International Olympic Committee (IOC), the International Association of Athletics Federations (IAAF), the International Badminton Federation (IBF), joined the Union Cycliste Internationale, the International Weightlifting Federation, the International Table Tennis Federation (ITTF), and East Timor's national football team joined FIFA. East Timorese athletes competed in the 2003 Southeast Asian Games held 2003. In the 2003 ASEAN Paralympics Games, East Timor won a bronze medal. In the Athens 2004 Olympic Games, East Timorese athletes participated in athletics, weightlifting and boxing. East Timor won three medals in Arnis at the 2005 Southeast Asian Games. East Timor competed in the first Lusophony Games and, in October 2008, the country earned its first international points in a FIFA soccer match with a 2–2 draw against Cambodia. East Timor competed at the 2014 Winter Olympics. ^ Octávio Amorim Neto; Marina Costa Lobo (2010). "Between Constitutional Diffusion and Local Politics: Semi-Presidentialism in Portuguese-Speaking Countries". ^ "Timor-Leste in CIA World Factbook". United States Central Intelligence Agency. Retrieved Nov 4, 2013. ^ a b c d "Timor Leste". The World Bank. Retrieved May 3, 2014. ^ a b CIA (November 29, 2012). "East and Southeast Asia:Timor-Leste". The World Factbook. Washington, DC: Central Intelligence Agency. Retrieved December 16, 2012. ^ "World Bank Country Groups". Web.worldbank.org. Retrieved July 17, 2011. ^ "Timor Leste: Human Development Indicators". International Human Development Indicators. United Nations Development Program. Retrieved 11 June 2012. ^ "United Nations Member States". United Nations. Retrieved March 28, 2010. ^ "European Union deploys Election Observation Mission to Timor Leste". Europa (web portal). Retrieved March 28, 2010. ^ "US Department of State: Timor Leste Country Page". State.gov. January 20, 2009. Retrieved March 28, 2010. ^ "CIA World Factbook". US Govt. July 1, 2014. Retrieved date=July 01, 2014. ^ "Brief History of Timor-Leste". Official Web Gateway to the Government of Timor-Leste. Government of the Democratic Republic of Timor-Leste. 2006. Archived from the original on 2008-10-29. ; A. Barbedo de Magalhães (October 24, 1994). "Population Settlements in East Timor and Indonesia". University of Coimbra website. University of Coimbra. Archived from the original on 2007-02-11. ^ "Flags of the World". Fotw.net. Retrieved July 17, 2011. ^ a b Schwarz, A. (1994). A Nation in Waiting: Indonesia in the 1990s. Westview Press. p. 198. ^ Department of Defence (Australia), 2002, "A Short History of East Timor" at the Wayback Machine (archived January 3, 2006) Access date: January 3, 2007. ^ Ricklefs, M. C. (1991). A History of Modern Indonesia since c.1300, Second Edition. MacMillan. p. 301. ^ "Official Web Gateway to the Government of Timor-Leste – Districts". Government of the Democratic Republic of Timor-Leste. Archived from the original on 2012-03-21. Retrieved July 16, 2011. ^ Benetech Human Rights Data Analysis Group (February 9, 2006). "The Profile of Human Rights Violations in Timor-Leste, 1974–1999". A Report to the Commission on Reception, Truth and Reconciliation of Timor-Leste. Human Rights Data Analysis Group (HRDAG). ^ The National Security Archive: Photocopy from Gerald R. Ford Library: Sentitive eyes only (PDF; 86 kB) 30 December 1974. ^ The National Security Archive: Photocopy from Gerald R. Ford Library: Sentitive eyes only (PDF; 317 kB) 4 March 1974. ^ "UNITED NATIONS TRANSITIONAL ADMINISTRATION IN EAST TIMOR – UNTAET". United Nations. Retrieved July 17, 2011. ^ Etan/Us (February 15, 2000). "UN takes over East Timor command". Etan.org. Retrieved July 17, 2011. ^ "East Timor: More than 1,000 refugees return since beginning of month". ReliefWeb. 2002-05-10. Retrieved 13 February 2013. 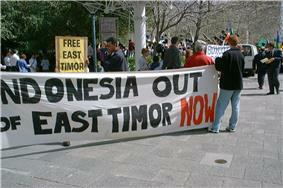 ^ "East Timor May Be Becoming Failed State". London: Web.archive.org. January 13, 2008. Archived from the original on January 13, 2008. Retrieved July 17, 2011. ^ "'"Asia-Pacific | Shot East Timor leader 'critical. BBC News. February 11, 2008. Retrieved July 17, 2011. ^ "UN wraps up East Timor mission". ABC News. ^ Jornal da Républica mit dem Diploma Ministerial n.° 199/09 (PDF-Datei; 315 kB). ^ "East Timor aims to join ASEAN". Investvine. December 30, 2012. Retrieved December 30, 2012. ^ "United Nations". United Nations. Archived from the original on 2010-04-02. Retrieved March 28, 2010. ^ "ReefGIS – Reefs At Risk – Global 1998". Reefgis.reefbase.org. Retrieved March 28, 2010. ^ "Timor-Leste's Economy Remains Strong, Prospects for Private Sector Development Strengthened". Asian Development Bank. ^ a b Schonhardt, Sara (19 April 2012). "Former Army Chief Elected President in East Timor". The New York Times. ^ a b "Observers divided over oil fund investment". IRIN Asia. ^ a b c "U.S. Relations With Timor-Leste". U.S. Department of State. July 3, 2012. ^ "The Story of East Timorese Coffee". East TImor Now. ^ "Highlights of the 2010 Census Main Results in Timor-Leste". Direcção Nacional de Estatística. ^ a b c d "Expanding Timor - Leste's Near - Term Non - Oil Exports". World Bank. August 2010. pp. iii. ^ "TIMOR GAP TREATY between Australia and the Republic of Indonesia…". Agreements, Treaties and Negotiated Settlements Project. Archived from the original on 2005-06-16. Retrieved 2013-02-11. ^ "The Timor Sea Treaty: Are the Issues Resolved?". Aph.gov.au. Archived from the original on 2011-06-04. Retrieved July 17, 2011. ^ Geoff A. McKee, oil and gas expert engineer, Lecturer, University of NSW, Sydney, Australia. "McKee: How much is Sunrise really worth? : True Value of a Timor Sea Gas Resource (26 Mar 05)". Canb.auug.org.au. Retrieved July 17, 2011. ^ "Prime Minister and Cabinet, Timor-Leste Government – Media Releases". Pm.gov.tp. Retrieved July 17, 2011. ^ "Gazetteer – Patents". Billanderson.com.au. Retrieved March 28, 2010. ^ "Population and Housing Census 2010: Preliminary Results". Direcção Nacional de Estatística. ^ "Maubere" article at the German WorldHeritage. ^ Fox, James J.; Soares, Dionisio Babo (2000). Out of the Ashes: Destruction and Reconstruction of East Timor. C. Hurst. p. 60. ^ Taylor, Jean Gelman (2003). Indonesia: Peoples and Histories. Yale University Press. p. 378. ^ Constâncio Pinto; Matthew Jardine (1997). East Timor's Unfinished Struggle: Inside the East Timorese Resistance. South End Press. p. 263. ^ Taylor, Jean Gelman (2003). Indonesia: Peoples and Histories. New Haven and London: Yale University Press. p. page 378. ^ "Table 13: Population distribution by mother tongue, Urban Rural and District". Volume 2: Population Distribution by Administrative Areas. Population and Housing Census of Timor-Leste, 2010 (Timor-Leste Ministry of Finance). p. 205. ^ Gross, Max L. (14 February 2008). A Muslim Archipelago: Islam and Politics in Southeast Asia: Islam and Politics in Southeast Asia. Government Printing Office. p. 119. ^ Jarnagin, Laura (1 April 2012). Portuguese and Luso-Asian Legacies in Southeast Asia, 1511-2011. Institute of Southeast Asian Studies. p. 106. ^ "Timor Leste, Tetum, Portuguese, Bahasa Indonesia or English?". April 20, 2012. ^ "Estados Miembros". Union Latine. ^ a b c d e "Human Development Report 2009 – Timor-Leste". Hdrstats.undp.org. Retrieved March 28, 2010. ^ Roslyn Appleby (2010-08-30). ELT, Gender and International Development: Myths of Progress in a Neocolonial World. Multilingual Matters. p. 92. ^ a b "Timor-Leste faces development challenges". Content.undp.org. January 12, 2006. Retrieved March 28, 2010. ^ a b c Robinson, G. If you leave us here, we will die, Princeton University Press 2010, p. 72. ^ a b "Table 5.7 - Profile Of Students That Attended The 2004/05 Academic Year By Rural And Urban Areas And By District". Direcção Nacional de Estatística. ^ "Timor-Leste". United Nations Population Fund. Retrieved 2013-02-11. ^ Hodal, Kate (June 25, 2012). "Cuban infusion remains the lifeblood of Timor-Leste's health service". London: guardian.co.uk. ^ Voice of America, June 24, 2007, East Timor Facing Food Crisis at the Wayback Machine (archived June 26, 2007) and Ministry of Agriculture, Forestry and Fisheries of Timor-Leste. ^ "Volume 2: Population Distribution by Administrative Areas". Population and Housing Census of Timor-Leste, 2010. 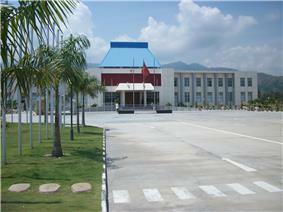 Timor-Leste Ministry of Finance. p. 21. ^ Hajek, John; Tilman, Alexandre Vital (2001-10-01). East Timor Phrasebook. Lonely Planet. p. 56. ^ "Constitution Of The Democratic Republic of Timor-Leste". Governo de Timor-Leste. ^ "Fresh start for East Timor's film scene". Sydney Morning Hearld. Retrieved 2013-10-03. ^ Madra, Ek (2008-10-30). "World's worst football team happy to win first point". Reuters. Retrieved 2013-02-11. (in Chinese)/ 东帝汶政治与选举 (2001–2006): 国家建设及前景展望East Timor, politics and elections, Jean A. Berlie, Institute of Southeast Asian Studies of Jinan University editor, Jinan, China, published in 2007. 1 Membership suspended since May 2009.